WELL, IT’S THAT time of year again. Temperatures are starting to dip, and hunting season is winding down. Most of the big game hunts have wrapped up, so you’d think that life as a conservation officer would begin to slow; but actually, this is about the time we hit the hills. Statewide, officers are firing up the coffee makers and stocking up on sugary snacks in preparation to spend long hours in the field patrolling. The plan: to protect animals as they move onto the winter range. As part of their investigation, officers seized this trophy buck. This was one of more than 20 poached deer in this case. 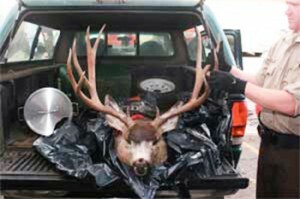 Last year, with the Utah Division of Wildlife Resources focusing on mule deer, administration in the law enforcement section asked officers to concentrate efforts on poaching in winter range locations. 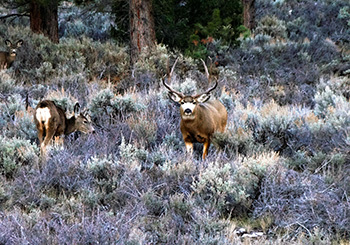 Starting in early November, hundreds of mule deer does flood the winter range followed by several lovesick bucks. Numerous sportsman and wildlife enthusiasts flock to the winter range in hopes of having an up-close look at large mule deer bucks. Unfortunately, there are also some individuals who use this opportunity to rob the resource and deprive sportsmen of opportunities. Poaching on the winter range is a problem that we face statewide. Last year in the Southern Region from November through January, officers investigated 15 separate mule deer poaching incidences. The deer that were illegally taken ranged from large trophy bucks to does and fawns. All the deer were shot and left to waste. Some of the poached bucks had only their antlers removed. One of these 15 cases involved more than 20 bucks killed within a two-month period. Fortunately, officers were able to catch the individuals responsible for this grievous act. This large buck was poached last year. The case, unfortunately, is still open. 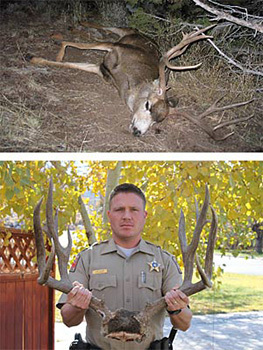 The combined efforts of concerned citizens and DWR officers brought successful conclusions to some of the other poaching instances, but most of them are still open cases. Officers plan to conduct patrols when deer are most vulnerable. This usually means starting early in the morning, making contact with individuals on winter range, or working deep into the night monitoring spotlighting activity. Spotlighting is not illegal in Utah, but you need to remember one important thing if you are planning to do it: it is illegal to locate protected wildlife with a spotlight or any other beam of light with a weapon in possession. Officers statewide are also enlisting help from a secret weapon that you may not recognize at first. “Robo deer,” as he is most commonly known by, will be spending time on the winter range patiently waiting to take one for the team. This lifelike robotic deer is used to help catch people trying to illegally take a deer. We’re also asking for your continued help to stop poaching on winter ranges. Statewide, there are 47 conservation officers. Each of them maintains the daunting task of patrolling, on average, 1,700 square miles per district. That’s a lot of land. That’s why we desperately need members of the public to keep their eyes out for anything believed to be suspicious or illegal. The best way to get in touch with an officer is to call the Utah Division of Wildlife Turn-in-a-Poacher (UTiP) hotline at 1-800-662-3337. This information will help out the officers in the region. These deer are currently on the winter range on a general unit in southern Utah. Take advantage of this exciting time of year by going outside and getting a close look at some big mule deer bucks. Just remember to help the mule deer by giving them plenty of space and support conservation officers by keeping your eyes and ears open for illegal wildlife activity. If you’re interested in seeing field reports from Utah’s conservation officers, you can check the law enforcement section of DWR’s website. Im really hoping everyone will do thier part a report any thing that does’t look right. Let’s all help in getting these people put in jail where they belong. Thanks to the DWR .. I am hoping this is a typo. “1,700 acres per district”, is only about 3 square miles. Thank you for catching that, Al. The post has been updated with the current information. Each officer maintains 1,700 square miles. I will certainly keep my eyes open. It is disgusting this goes on year after year. maybe stiffer penalties would help? Thank you, Josh. Great article! It is surprising to me that anyone would think at any time that they are justified in taking wildlife illegally, that being said, I feel that some officers have a general stance guilty till proven innocent when approaching hunters. One great example where the division has improved the general likability of their officers is Farmington Bay, for years when I’d hunt there I dreaded being “Checked.” Not because I was guilty of any crimes, but because of this general attitude, which I can understand after seeing some of these pictures, however there have been several pleasant encounters with wildlife officers this year that have been helpful, courteous, and willing to share their detailed knowledge with me about wildlife. I think the DWR outreach will play a big goal in putting a stop to poachers, just as much as enforcement. Thanks for all you do at the DWR, Utah is an amazing place. I cannot find on your web site the deer winter range land closure in the lucin grouse creek area of western box elder county. If so when will the land be open. what is the consequence of going into a winter range before it opens? I think everyone who is caught poaching should have to put a scarlet letter on their vehicle so the general public will be aware of who these people are and they will be able to keep an eye on them.